What is Saridon N and what is it used for? within half an hour and lasts approximately six hours. – Fevers occurring with flu. When Saridon N forte 400 should not be used? anti-inflammatory medicines, to pain killers or to antipyretics. swelling of the skin and of the mucus membranes or skin eruption (urticaria). – In gastric or duodenal ulcer or in gastric or intestinal bleeding. – In inflammatory bowel diseases like Crohn’s disease or hemorrhagic recto-colitis. – In severe cardiac, hepatic or renal diseases. – In children less than 12 years. The use of Saridon N has not yet been studied for this age group. What are the precautions to be observed while taking Saridon N? – Gastric or duodenal ulcer. – Renal or liver troubles. – If you are treated with anti-coagulants or if you suffer from blood coagulation disorders. – If you are treated with anti-inflammatory drugs or with pain killers. lithium, digoxin, methotrexate, baclofen, phenytoin, probenecid or sulfinpyrazone. self prescribed). 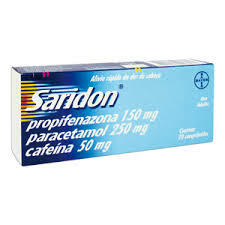 Saridon N can affect your reflexes, your driving ability and your ability to use tools or machinery. Saridon N: could it be used during pregnancy or lactation? Important: Saridon N should not be taken during the last trimester of pregnancy.